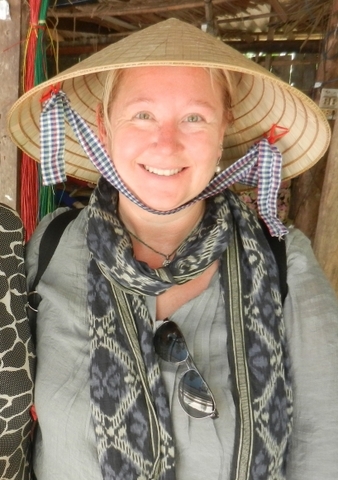 Wherever you go throughout Thailand, Cambodia, Laos and Myanmar you will encounter Spirit Houses. Often you will discover them in the corner of a yard outside the house or near the entrance to a business. They will always be in an auspicious place on the property and a priest may have been called to select the best spot. Spirit Houses honor the spirit of the property and keep them happy by providing them shelter. Today on Souvenir Spotlight, we feature the Spirit Houses of Southeast Asia. 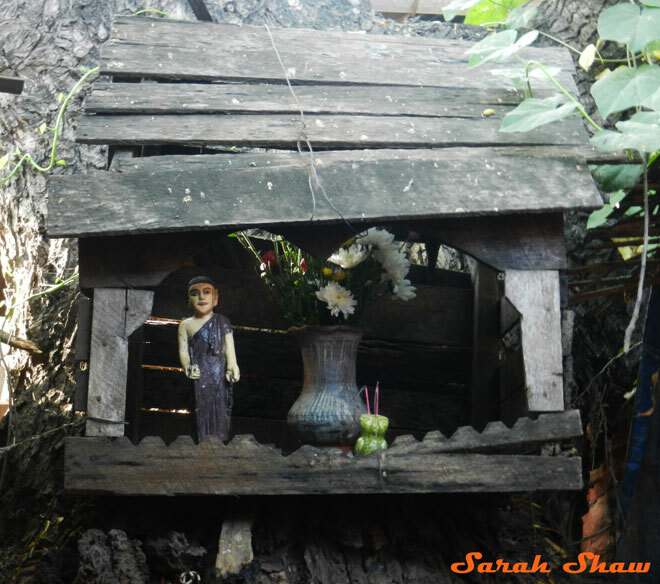 The spirit house pictured above was found in the garden at Jim Thompson’s house in Bangkok, Thailand. The humble Spirit House pictured above is attached to a tree at a market in Bagan, Myanmar. Spirit Houses are an ancient tradition and tied to the Animist practice of worshiping spirits. In Animism, there is no separation between the physical and the spiritual world. All beings, animals, plants, objects and even elements like wind have souls, or spirits. Even after Buddhism, Christianity and other religions were introduced to the region, animist practices became intertwined with these other beliefs. The spirits can be both good or bad and you want to encourage good spirits to reside at your home or business so they can offer you protection. A Spirit House gives these Guardian Spirits an attractive place to stay on your property. 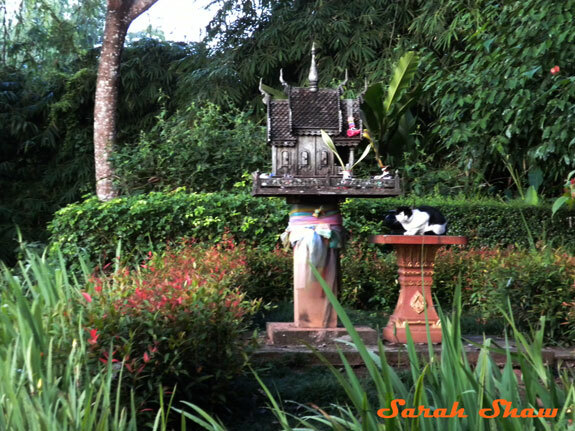 Wandering the gardens at sunrise at the Anantara Golden Triangle, I came across this cat with the Spirit House. Perhaps it was asking for mice to visit the Spirit House, too? There are eight Guardians for the Land that can be induced to stay in your Spirit House. There is the Guardian of the House who watches over your home and protects it. This same Guardian is called upon to assist with business matters as well as it is common for one’s office to be located at or near your house. The Guardian of the Garden is also offered his own house in exchange for protecting your flower beds, gardens, fruit trees and yard. The Guardian of Gates and Stairwells is believed to live in the doorstep of a house which is why you should never step directly on it when entering a home. Other common Guardians are the Protector of Animals, the Protector of Barns and Storehouses, the Protector of Forests, Mountains and Fields, the Protector of Waters, the Protector of Military Forts and lastly the Protector of Temples. 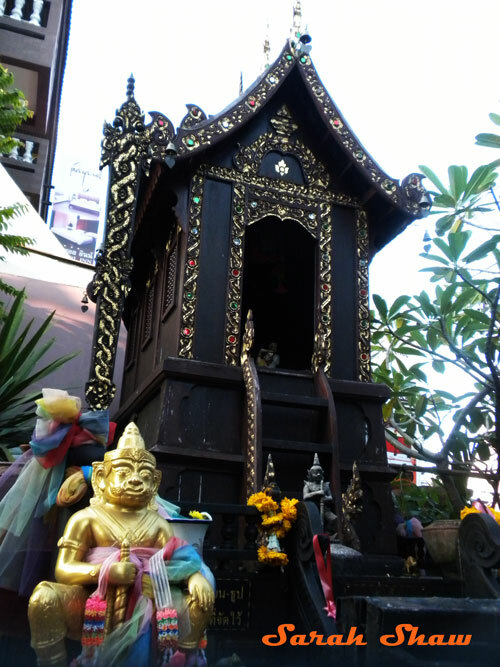 Outside a temple in Chiang Mai in northern Thailand, I encountered this Spirit House. Most spirits are finicky pranksters and they require respect from humans to keep them from interfering with a happy home or business. Offering a beautiful spirit house is the first step in appeasement. Often the Spirit House will be constructed of wood and will resemble a traditional house or temple. It will be placed on a pedestal in an auspicious place on the property and even sometimes inside the home or business. The stairs attached to the house make it easy for the spirit to enter and exit as he chooses. 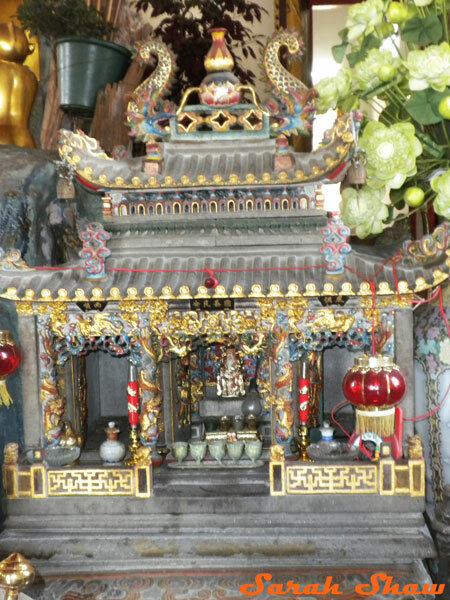 Statues, small figures, animals and other symbols may be added around and in the Spirit House as well as furniture and small flower arrangements. After completion, the desired spirit will be formally invited to reside in his new home. The family or business owner will regularly make offerings to the residing spirit in the form of burning incense and candles, flower garlands, betel leaves, bananas, rice as well as other food or drink. 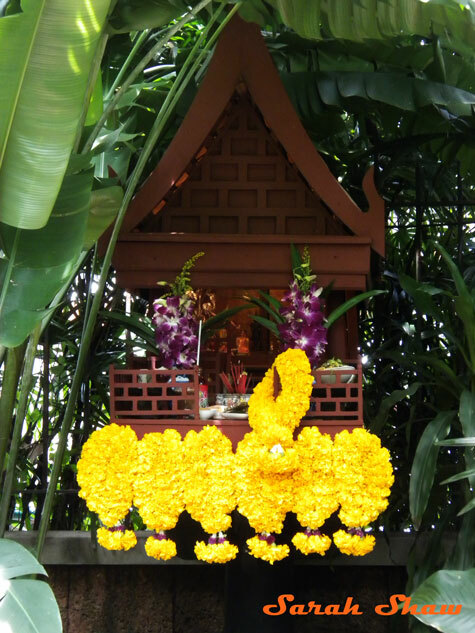 At a temple on the grounds of the palace in Bangkok, you can find the Spirit House pictured above. Spirit Houses come in all sizes from the very small to quite large installations. Budget and the status of the spirit you wish to attract will dictate the requirements. You can easily find Spirit Houses for sale in local markets as virtually everyone will have at least one at their home. Depending on the size, you may be able to fit it into your luggage or carry-on. Or you may want to have your Spirit House shipped home to meet you on your return. There are many places within the U.S. that you can find authentic Spirit Houses. One of my favorites is Eastern Serenity and they have a variety of sizes to fill most needs and fit many budgets. I suggest you star with their Eastern Serenity’s Tiny Spirit House as a way to begin your adventure of inviting a Guardian to your home. I also really love Novica’s selection of Spirit Houses but I see they are backordered at the moment. If you, and your Guardian, have some patience you should check out their offerings. Spirit Houses also make attractive accents in your home and I have also seen them used as bird feeders. 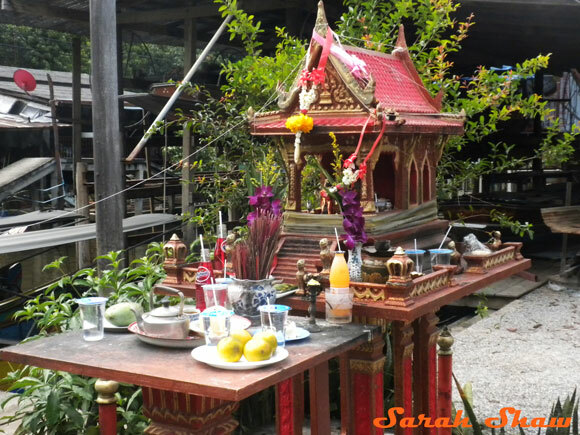 The vendors of the floating market near Bangkok, have been generous in their offerings at this Spirit House. Surely they petitioned for a successful day of sales. I hope you have enjoyed today’s Souvenir Spotlight on Spirit Houses. As you can tell from the pictures, Spirit Houses come in many forms. Some a very humble and are pieced together with a few bits of wood. Others are quite grand and more elaborate than most of our homes. One thing is common, they are all visited, the resident spirits are honored with offerings and petitioned for assistance. If you had a Spirit House, what would you ask for help with?